Skies are overcast, gusty winds have kicked up and it has rained off and on for the last 24 hours. After almost three months of non-stop sunshine and blue skies, a change in the weather has arrived. The weekend has delivered more typical October weather. I must admit that I am not unhappy about the change. 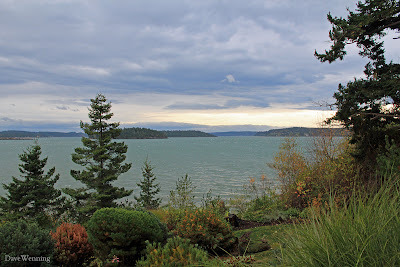 There is a certain comfort that Northwesterners find in the dark skies, sun breaks, blustery winds and yes, even in the rain. The Camano Island radar image also reveals something we haven't seen in a while. 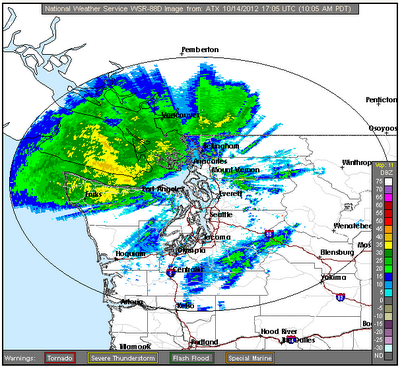 At the moment of the screenshot, the Olympic Rain Shadow was in play here. The brighter sky over Whidbey Island in the top photo is how the "shadow" often appears to us here on South Fidalgo. As I write this, that rain system is arriving, and the winds are beating the drops against the windows. The sun is shining even more brightly through the Rain Shadow over Whidbey. The trees are sounding the arrival of wind gusts and there is a low surf rolling in on the beach. It is finally autumn in the Northwest and we are home again. It must be a welcome sight...a little storm! It's still Indian summer down here. Wishing for some cooler temps!